As I attended my latest trial, it occurred to me just how unknown the subject material is for so many competitors. This class is intense. It digs into what makes each dog tick. What gets them excited? What is challenging? If they don’t perform the same at a trial as at home, why not? Or maybe they struggle even at home. How can we create custom games for each participant to help them find trial environments easy? Or how can we move forward with challenges we are seeing at home? Cole, cocker spaniel: An amazing, drivey agility dog. Screamed on the startline. Tail never stopped wagging. Happy to do whatever I wanted with excellent focus. Incredibly food driven. People aggressive. Dog aggressive. Multiple health issues. Austin, vizsla: Super athletic. Could bounce 21 feet with ease. Highly independent (would choose to hang out on a different floor than the rest of us). Extremely environmentally focused (as he was bred to be!). Moderately food driven unless overstimulated by environment. Very sensitive and easily worried. Regan, border collie: Perfect structure. Zero work ethic. Unmotivated by food, toys or praise. Happy to trot on course; very difficult to convince to go faster. Incredibly sensitive to pressure and would wander off sniffing if she sensed too much. Smitten, border collie: High drive. Zero self-control. Toy obsessed. Low confidence. Blazing fast. Dog reactive. Quick to decide on course and will drive a line she finds with no ability to redirect. Integrity, border collie: Medium drive. Hard worker. Unconcerned about making mistakes. Prefers accuracy over speed. Can get sticky. Doesn’t generalize well. Easy ringside and to live with at home. Can be thrown off by strange surfaces, elevators, and such. Heart, border collie: High drive. Extreme focus. Loves toys. Loves praise/interaction even more. Natural jumper. Does everything at top speed. Tries to rush each obstacle on course and pushy in general. Can be sensitive to low rate of reinforcement. Low confidence. Very snuggly. My hope is that some of this experience is relevant to your canine partner, and you would like to join us for a fun four weeks of class! Most folks that have taken it have found it to be pretty life changing. I hope you do too!! The next session of “Find Your Missing Link: Unlock Your Dog’s Full Potential” starts at Agility University very, very soon, on August 22nd – next Monday! I’ve pondered about what I want to write, and it seems only fitting to write the whole story. About how I thought I wanted another cocker spaniel, but didn’t want to deal with the hair. About how I flew to Oklahoma to pick up a sight unseen puppy that screamed the loudest in the litter and then that entire litter scattered to the four corners of the yard rather than say hello to me. About how that puppy quickly let me know that his world did NOT revolve around me. He could scream loud enough to make my head vibrate. And he didn’t give two flips about my treats, my toys or, well, my anything. It took four years to convince that young dog that agility was fun. It took eight years to get that dog to run as fast in competition as he did when I had a meatball in my hand. He packed his fifteen years full of lessons for me, and while I started off as an unwilling student, I quickly caught on that if I didn’t start to listen and learn, we wouldn’t get very far in the sport I was so passionate about. He remains the highest titled vizsla in USDAA of all times, with 8 titles that no other vizsla has ever earned, including ADCH-Bronze, ADCH-Silver, and Tournament Master-Platinum, and a lifetime 221 titling qualifications, 50+ more than the next vizsla in line. 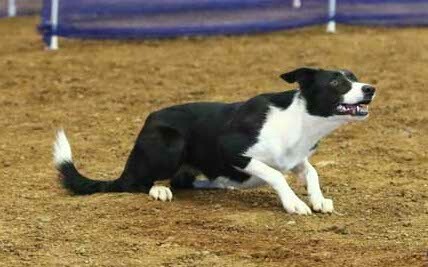 He placed 3rd in the Invitational Finals and 5th at AKC’s National Finals (fastest non-border collie!). He also won both Standard and Jumpers at the Vizsla National Specialty. He really and truly did it all. 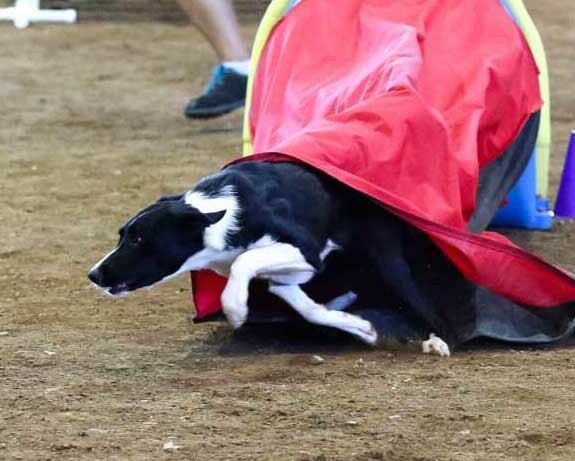 Austin was not my first agility dog, but he’s the first dog that asked me to become better. I once told someone, while running my cocker spaniel, Cole, that I did not want to be a dog trainer, I just wanted to be an agility handler. Austin led me kicking and screaming into the land of behavior theory and dog training. I was a slow, unwilling student. I had so much to learn and I made so many mistakes. But somehow, we got better together. Over time, I realized that Austin needed earlier handling cues. He led me on handling adventures, seeking new knowledge and ways to “break the rules” and tell him where those long strides needed to travel. I learned how to sometimes choose my own battles, and let go of things like the perfect contact behavior, because motivation and joy were just more important. We developed a signature style that had me FAR off his line, because, well, that’s how Mr. Independent liked it. We only did leadouts when absolutely necessary, and his favorite was a throw back and run, especially to a tunnel. Learning how to help Austin focus on and love agility is the source of so much of what I teach students. I can truly empathize with how it feels to have a partner that isn’t interested, or can’t stay with me, or doesn’t show the enthusiasm that I know is inside. Much of what he taught me to bring out his best at trials is the source for my online Fire & Desire class. He helped me connect with so many people that I know today, as we struggled in all of those seminars and camps as we tried to find each other. Heck, he even convinced me to ask at IBM if I could work at home half-days, so that he wouldn’t be alone for too long during the day. That tiny decision eventually led to wanting a more flexible job and going to SAS, and then taking the plunge to teaching full time. What many may not know, is that I chose the vizsla breed in the hopes that Gary would find joy in that puppy, and that we could find pleasure in raising him together. Austin quickly became Gary’s dog in many ways. We laughed at Austin daily. That dog could sleep in the funniest positions, and frequently he would make us joke and laugh in the way he walked, or a look he gave. So much joy and laughter in our marriage was the result of this wonderful dog. How do I REALLY express just how much we loved this dog? Maybe it’s by telling you that when we found out he had cancer, we DID go after it aggressively, removing his spleen. Undergoing chemo. Starting the turkey tail powder. Maybe it’s by telling you that we fought the 2nd cancer. Again, undergoing surgery. Maybe it’s by telling you that we underwent a 3rd surgery, this time removing a benign lump. Or maybe it’s by telling you that we did NOTHING when we found the 3rd aggressive cancer, knowing that for our boy, the stress of doctor’s visits and surgeries and needles and tests was now worse than any chance of extending the duration of his life. Or could it be by telling you that I stopped all his supplements, including the miraculous turkey tail powder, when he said he didn’t want to eat them anymore. Is it when we put horse water buckets in the house for him to drink out of, because they looked so damned much like toilets that he would drink out of them instead? Or is it when we stopped making him sleep in the bedroom because he loved sleeping on the sofa so much, and Gary would set his alarm for 2am every night to let Austin out, AND kept a baby monitor on, in case he needed to go out other times? Or is it when we finally decided to let him go? My dog that could still go for 30 min daily walks. Who could still eat most of a meal? And who still wagged his tail every time he saw me? You see, how do I explain to you that the light in his eyes was gone? That life was a chore for him? That nothing brought Austin joy any longer? My dogs speak to me; they talk to me all the time. He so clearly said he wanted to leave. My heart broke, but I heard him and had always promised him he would never suffer if I could help it. My gift of a dog showed me some tiny signs the morning of, that he was just before the edge of suffering. Oh my god, just to make sure I knew it was the right time. And we all slept together in the sunroom that last night. He gave me several precious hours of sleeping on my stomach that I will never forget. I’m so grateful that I could live in that moment. No thoughts to a few hours away. Just holding and memorizing that body I had held for fifteen years. Our last morning was beautiful. The angel that came to our house was amazing. Austin felt no pain or worry. He wagged his tail when she came in, so eloquently saying “thank you so much for coming by.” We were able to snuggle with him and cuddle with him and it truly was just as magical and special as it was heart wrenchingly painful for us. So I don’t know how one exactly explains just how much a dog means to them, but I can tell you that we did our very best to be half as good to him as he was to us. I’m really enjoying the return to my love of landscaping and horticulture at our new property. Before I had dogs, I had plants, and I was very fond of them. I asked my family for bulbs for my birthday, and boy did I get bulbs! I now have almost 200 bulbs to plant as soon as possible. As I was planting the first of my bulbs today (daffodils and crocus), it occurred to me that there was no instant reward for my work. If I did the job properly, there would be exactly zero evidence that I planted anything. And I will have to wait MONTHS until I see the flowers as a result. Never mind the fact that the time of year to plant bulbs isn’t the prettiest to be digging around in the dirt. I even got rained on towards the end of planting. I couldn’t help but think about how this parallels so many things in life, and of course, my thoughts drifted to agility training. So many of those little tricks we teach puppies and games we use for foundation will not reveal their true benefits for months or even years to come. It’s so easy and tempting to “skip ahead to the fun stuff.” Who wants to spend months on a short board or a tippy board or channel weaves before moving to the “real equipment?” Even fitness for our canine partners is something that must be built gradually, over many weeks and months. Life has been a busy whirlwind around here…moving to a new house, lots of seminars, Cynosport, my first online class, the US Open, and soon Thanksgiving and then EO Tryouts! I’m really enjoying LIFE right now. A lot of recent “real life” activities, like packing/unpacking, sorting out what we want our new landscape to look like and feel like, REALLY enjoying spending time with my fabulous husband…well, it brings a lot of perspective and balance. But all that said, I’m just as passionate and crazy about agility and my dogs as ever. And this has lead to the inspiration for my latest blog post. For folks that have been following me for awhile, you may have heard me say how I don’t really care if I win, if I get on a World Team, if I stand on a podium or wear a medal. I do love those things, and we celebrate like crazy when they happen, but those moments don’t DRIVE me. I always thought that to be a bit odd…and I’ve seen the confused look on others faces when I try to explain this…how can this be? Well, a tiny piece of that answer presented itself to me while at the US Open, and I’m so excited to share it! I LOVED our performances at the US Open. My girls and I were so in sync with each other out there. Grit has found a new level of joy, more confidence than ever before, and that is all resulting in new speed, both raw ground speed/acceleration AND obstacle performance. Makes me giddy. And Heart, man, she’s just so INTO it. She’s quivering to start…fights to do what she thinks I want at superdog speed, and comes back again and again no matter what happens on course. This dog is truly going to be a FORCE. AND…our performances on paper were pretty much NOTHING to get excited about. I think Grit ran two courses clean all weekend. Heart didn’t have any clean runs. But you see, my goals aren’t about a particular weekend, world team, or podium. They are infinitely farther reaching than that. They actually span longer than a dog’s lifetime. My goals are to get better. Do I have more skills than I did last year? Do I have more confidence than I did 6 months ago? Is Heart’s foundation coming along more solidly than Grit’s did? And for each of these questions, each and every run was a resounding YES!!!! There was a joke going around where the best handling plan for Biathlon Jumpers was that the dog NOT know where they were going…then you actually had a chance to run clean. While I did find the concept amusing, running in that way simply doesn’t fit with my long term goals…my vision… So I did my best to run telling them how to navigate the course as fast as they could, and I “failed”. But I learned sooo much!! This is far more of a win in my mind than the short term “win” of a clean run. So we continue to learn and grow and struggle…because we keep our eye on the prize. Beware of the temptations to do otherwise, whether it’s lose your contact criteria, temporarily forget your dog’s motivation needs, or simply allow frustration to take over. Keep the reasons YOU play this sport at the forefront, because in the end, those are all that really matter!! It seems to me that Foundation is a hot topic at the moment. Or maybe it’s just on my mind all the time given that I’m beginning to trial a young dog. I hear folks worrying that they won’t do it right “the first time”, and I hear criticism that because this dog did “X”, clearly it didn’t have the right or enough Foundation. First off, proper Foundation does not guarantee a robot for a dog. It doesn’t mean that there will not be bumps and surprises along the way. I think the benefits of extensive Foundation are many, but perhaps not so obvious. Primarily, Foundation gives dog and handler a chance to bond and deepen their relationship. Humans are creatures of habit. We want our dogs to understand that when mom or dad does this, it probably means that. These lines of communication can be deepened and generalized early on in Foundation games. Foundation gives the dog (and handler) something to fall back on, so even if things go awry, revisiting known Foundation level skills can quickly rebuild known behaviors. I’ll give a couple of examples that I’ve experienced recently with Heart. For anyone that has seen me train on the sidelines of a trial or taken a seminar where Heart was the demo dog, they can attest that she has an amazing stay. We have been playing stay games almost since the moment I picked her up, and I’ve worked hard to think of as many ways to challenge her stay behavior as I can. It’s nearly impossible for someone to trip her up. So imagine my surprise when at just her 2nd trial, her stay EVAPORATED. Like, hold onto her scruff when removing her leash, because she was just going to take the first obstacle she saw… Oh my. That sure gave me pause. Did it mean that all the Foundation work we did was worthless? I don’t think so. In her case, it was suddenly a big deal that I didn’t have a toy on my body to reward her with immediately, and she was SUPER stimulated by the environment. But we took this information, worked very hard to make training simulate the challenges of trials, and by her very next trial, she stayed solidly 9 for 9 runs. Another example is Heart’s running dogwalk. It’s gorgeous. You may or may not see it show up at a trial near you any time soon. You see, when I trained it, I proofed for all sorts of imaginable things. It was nearly impossible to get her to miss. I have witnesses. LOL However, as of late, she has realized there’s this thing called HANDLING. And watching me is critical as you never know what I might do. And, well, doing that while remembering to do her job on the dogwalk is tough. So I put in all the Foundation I could imagine on the dogwalk, and yet, here we are rebuilding once again, now that she has an inkling of what the game is all about. Agility is full of layers. Each time you add another layer, you may need to strengthen or rebuild components that were once easy. It’s pretty easy to teach a stay before a dog knows how fun it is to go. 🙂 Once the joy of go is realized, stay may need to be restrengthened. Not the end of the world, just an evolving piece of the puzzle. All photos are from Heart’s 2nd trial by Dean Lake. Tryouts. So here we are again. 🙂 It has been two years since I’ve attended this event. Last year, Grit and I were preparing for our first WAO event in Italy, and I figured one international excursion was enough. One of my favorite aspects of these major events is how much they tell me about my training, my preparation, and how far I have come along in my journey. Over the past two years, a lot has happened for us. I’ve worked very hard on my ability to react in the moment, and I’ve worked hard to deliver information to my dogs earlier and earlier. Nothing is a better test for me in these two areas than running on the turf at Hopkins. I’ve made my feelings about this surface very well known. I stand firmly in my opinion that it’s not the best surface to field World Team members. However, it will surely give me excellent feedback on whether or not my dogs knew where to go in time, and if they didn’t, how quickly I can react to get them back on course. I love that my girls both push me to be better and better. We aren’t here to compare ourselves to others and fret about where we may or may not sit on the leaderboard. We are here to learn and grow and celebrate how far we’ve come. THAT is what fuels my fire. Can’t wait to watch it all unfold! I didn’t think I’d have the energy to contribute to this blog action day, you know, being home all of 36 hours before my next 12 day trip (yes, for those following along, it seems I miscounted!). But here I am, all cozy at a Flying J in South Carolina, and I felt the urge to post, even if perhaps it’s a short one, as bedtime is already calling my name. 1) Find your passion. Figure out what your gift to the world will be. Share that gift as often as possible. 2) Stay true to what you believe. Fight for your beliefs. 3) Honor your dogs. Recognize that this crazy game we play is our choice, not theirs. Make a pact that you will ensure this game is as wildly exciting for them as it is for you. Every. Single. Day. 4) Listen to your dogs. They are speaking every moment. What are they saying? 5) Strive to be better. No one’s journey is complete if they are still alive. Seek ways to improve what you know, how you live, and how you see the world. 6) Find balance. Keep life in perspective. 7) Take care of yourself. We are only given one body and one mind. Nourish and cherish both. What will YOUR 2015 look like? This is one of my favorite times of year… I get a chance to sit back and reflect on all that happened in 2014, and then turn my attention to 2015. A blank slate. A FULL year of opportunity! I thought I would share a bit about our reflections and goals, in the hopes that it will encourage you to do the same! Austin: A strong year for Austin. Regular 30 min flexi walks with much trotting, sniffing and peeing. Lots of hikes, some of which I momentarily lost him, only to realize he was AHEAD of the rest of us on the trail. 🙂 And an unfortunate finding of cancer in December, which we are actively fighting. Integrity: Wow, what can I say? 2014 WAO Team in Italy. Earning her ADCH. Learning powerful lessons about jumping. And how to take care of the needs of HER body. And letting Grit be Grit. This has been a year of growing closer, and starting to gel as a team. Heart: Haha, surprise! How about a puppy in 2014? Heart is pushy and full of life. We communicate at a level I’m not sure I’ve ever experienced. It’s like she was born having already read Melanie’s Playbook. I absolutely adore her. She has helped me take my foundation training to a whole new level of fun and value. Melanie: It has been a powerful year of personal growth. I experienced my first World Team that involved a win-on spot. I turned 40. I decided to launch a new business and return to my passion of teaching. So what do you have to celebrate from 2014, and where will you go in 2015? Lately a big chunk of our household’s focus has been around Austin’s health. How is he feeling today? Is he sleeping more than normal? Did he eat with his usual gusto, or maybe just 85% of his normal enthusiasm? What’s the state of his poop? Seriously, these are the questions that circulate around our house. You see, Austin was diagnosed with cancer this month, at almost 14 years of age. A hystiocytic sarcoma of the spleen to be exact. They took out the spleen, but it’s unlikely that means it’s gone for good. Now, do understand, Gary and I already had this conversation…years ago…about what we would do if Austin was diagnosed with cancer. Bone cancer runs in his family, so we were prepared for this already. And besides, we already had experience with cancer in one of our dogs. Cole, my cocker spaniel, had a bladder tumor. We treated with piroxicam, but otherwise let it be. So clearly we would not pursue chemotherapy or radiation or any other such extreme measures to prolong Austin’s life just for our own benefit. But let me tell you, until you’ve lived it, and faced that decision head on, you really have no idea what your decision will be. Every dog is an individual. Every person is an individual. And we were decidedly NOT going to pursue chemotherapy, and yet, here we are, one week after Austin’s first treatment. We THINK he’s doing well. I’m keeping a journal. Most days have appeared normal. But one day he had a slightly reduced appetite for one meal, eating slower than normal. Another day he seemed a little depressed, perhaps slightly lethargic, but it’s hard to tell with a dog that LOVES his naps, and spends most of his days snoozing away. If these symptoms are, in fact, related to the chemo, they are mild, and do not last more than a few hours. But it’s possible that he is experiencing some level of side effect from the chemo. Austin is an otherwise happy, healthy guy. While checking out other organs during his splenectomy, his vet proclaimed him to be “pristine” with “kidneys of a 4 year old”. He goes for regular 30 min walks and forges ahead on our hikes. He is perhaps not your typical almost 14 year old dog. Or maybe he is. But in either case, we just couldn’t sit back and do nothing. So we treat. And we ask ourselves every day if we made the right decision. There is no wrong decision here. And we won’t know for months or even years if we made the best one. But I can tell you this. You won’t know for sure what decision you would make until you are there inside of it. That much I know is true. We make choices on a daily basis. Sleep in or get up early for yoga. Train weaves for five minutes after work or settle in on the sofa for some TV time. Life is full of them. Frequently they involve a decision between short term gratification and long term gain. Sometimes the decision is clear cut and other times it takes a bit of processing. In the US, we are quite lucky. Trials are held all year long in multiple organizations. Many of us are used to supporting several organizations, competing in their trials enough to gain eligibility to attend their National events. As more organizations enter the scene, and as qualification requirements increase, some new choices that we haven’t had to make are being introduced to our agility equation. How many weekends of trailing per month fit your lifestyle and wallet? How many weekends of rest or activities outside of agility do you and your dog need for mental balance? How much training or returning to foundation is needed to inch your team along towards your goals? These are the important questions for my household. They must be answered first. Only then can I ask, based on those answers, how many weekends are available? Do those weekends allow for the new qualifications for all the organizations I’m used to supporting? I’m personally to the point where the answer is NO. I’ve got to make choices that I haven’t always had to make. I don’t want to spread myself and my dogs so thin that we risk our long term goals, our health, or our passion for the game. I find it very sad when I hear someone “has” to go to a trial, that they really don’t even want to go, but they’ve gotta earn those Qs… And I’ve found myself on the verge of those feelings as well. For me, that is a big red flag! We don’t HAVE to do agility at all. It’s a fun game that we are fortunate enough to play with our dogs. Let’s be sure to keep it fun. And let’s be sure to honor our dogs with the choices that we make.